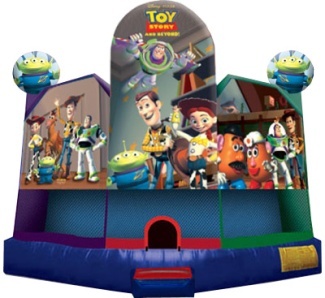 Toy Story ClubHouse Jumping Castle will be a fabulous addition to your party and event allowing you to reward the children that are so very special to you. Your children will find themselves captivated by vibrant colors of this Toy Story themed castle. You will find yourself drifting back to younger days as you watch your family and children enjoy their Toy Story friends in this Jumping Castle. Our Toy Story Clubhouse features all of your favorite characters including Woody and Buzz! JumpMaxx prides ourselves in providing America with newer, cleaner, high end entertainment with inflatables like the Toy Story Clubhouse and many others.